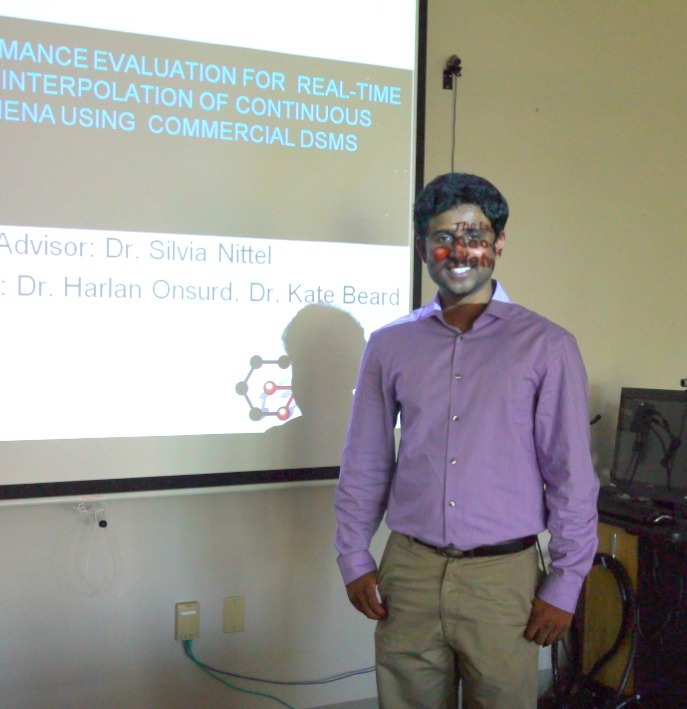 Today, Balaji presented the work and results of his Master’s project completed this spring semester, and now successfully graduated. Congratulations, Balaji, well done! Smartphones and tablets have made users be ready for instant and latest updates. People extensively rely and use these modern devices to know their surroundings. They have a dual role to play: they get information and also can act as sensors, which can share data. This is made possible due to the integration of low-cost, microsensors like accelerometers, proximity sensors, GPS, ambient light sensors, compasses, etc. However, in the near future it is a possibility that environmental sensors like those measuring humidity, temperature, certain particulate matters, radiation levels, etc. might get deployed as well and then these sensors can act as mobile stations which can share and update phenomenon of their surroundings. However, such applicability means that spatial interpolation of the mass-measured phenomena must be done at near real time so that users can also be clients ‘seeing’ the entirety of the phenomenon in their vicinity. Managing such mass data updates from mobile sensors requires novel data management technology that can keep up with processing this data onslaught, i.e. data stream management systems. There are a few out-of-the-box data stream solutions offered by industries today. Some prominent ones are Esper, IBM InfoSphere Streams, Microsoft StreamInsight, Oracle CEP, StreamBase, etc. However, not much work has been done to use a DSMS and test out with respect to real time spatial interpolation of continuous phenomena. The project explores whether this type of real-time spatial interpolation of a continuous phenomena based on large number of discrete sensor data streams can be accomplished by using the off-the-shelf functionalities available in commercial DSMS available today. The project also introduces the concept of spatial field data model, which provides a robust and an extensible framework to define fields and their behavior. Finally, a DSMS application was built and tested with simulated data from the Fukushima nuclear plant accident in Japan 2011. Experiments were conducted to test the performance and analyze the bottlenecks of using a commercial DSMS.